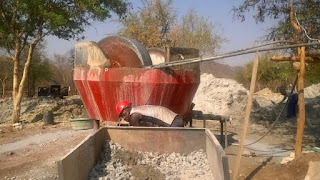 ZVISHAVANE - Canada 64 Gold Mine, which is located 20 km away from Zvishavane, has increased its production after acquiring state-of-the-art roller mill recently. The mine director Polani Mathemabi said they shifted from using stump mill to the new roller mill which is more effective and efficient. "We recently acquired a roller mill which is more efficient compared to the stump mill we were using before. This increased our gold output by 20 percent," said Mathemabi. He added that they were recently rated the second best gold producing company in the country under the Small and Medium Enterprises (SMEs) category as they produce an average of 15kg of gold per month since March this year. "We have been named the Miner of the Year by the Zimbabwe Miners Federation in July this year. I am happy that our work is being recognised," Mathemabi said. "We have partnered Bedford Blue 1 Mine and Mnene 100 which are owned by Charles Shava and we have no doubt that the move will increase out gold output. The roller mill produces at least three tones per hour which is twice more than the stump mill," he added. Shava said he is very happy with the current production and hinted that they are considering to increase the manpower.